Home Reviews Honor Play Gaming Review: Does GPU Turbo Really Make a Difference? 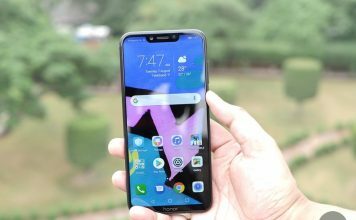 Honor Play Gaming Review: Does GPU Turbo Really Make a Difference? Huawei’s sub-brand Honor recently launched the Honor Play — its low-priced phone that comes with the company’s proprietary GPU Turbo technology. A technology that Honor claims gives a pretty impressive 60% boost to gaming performance on the phone, and a 30% reduction in battery consumption while gaming — all thanks to software tweaks and improvements. Well, we have the Honor Play with us and I put it through its paces playing games that support GPU Turbo. Here’s how the phone performs as compared to other phones in its price range, and phones with similar specs. 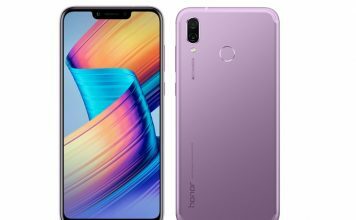 Before we dive into the Honor Play’s gaming performance as compared to other, similar phones, let’s take a look at the specs Honor has packed inside the Honor Play that starts at Rs. 19,999. Right off the bat, it’s actually pretty impressive that this phone has a Kirin 970 SoC at this price. Anyway, let’s take a look at the Honor Play’s gaming performance. First up, we ran a couple of benchmarks on the Honor Play to get an overall idea about the phone’s performance. 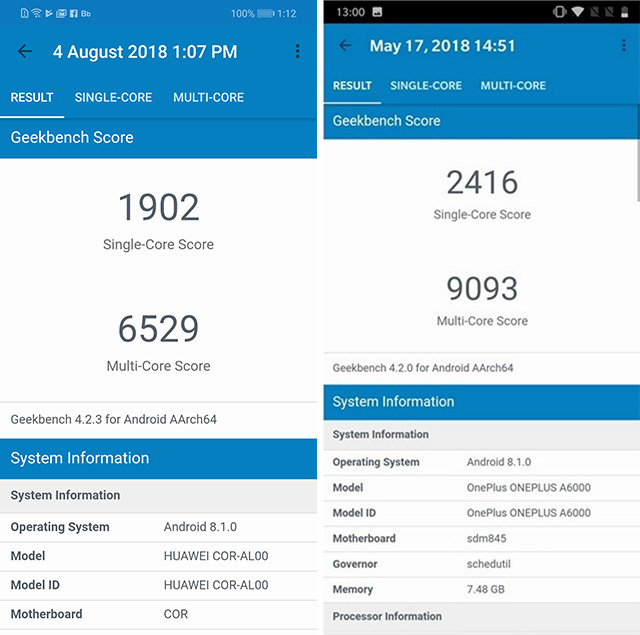 As usual we tested the phone with Geekbench, and AnTuTu to see how it performs. To compare, we also benchmarked the Redmi Note 5 Pro because it’s priced similar to the Honor Play, and the OnePlus 6 because it comes with Qualcomm’s flagship SoC — the Snapdragon 845. In Geekbench, the Honor Play scores 1902 on the single core test, and 6529 on multi-score. That’s a score we’ve come to expect from the Kirin 970, but it’s nowhere near the scores achieved by Qualcomm’s Snapdragon 845 on Geekbench which crosses 2400 on single core, and 9000 on multi-score with ease as we saw when benchmarking the OnePlus 6. However, the Redmi Note 5 Pro which comes in at a similar price bracket and packs in a Snapdragon 636 scores 1341 on single core and 4877 on multi-core tests, so clearly the Honor Play is better in its price range, if not on the same footing as Qualcomm’s flagship offering — the Snapdragon 845. In AnTuTu, the Honor Play scores 1,89,062 which again is quite underwhelming when compared to the OnePlus 6 which scores 2,67,128 on AnTuTu. However, benchmarking the Redmi Note 5 Pro shows once again that the Honor Play is better in its price range. 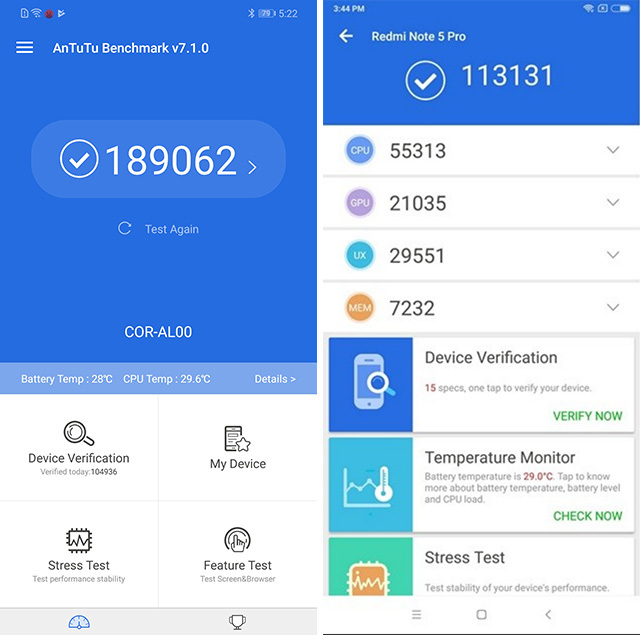 The Redmi Note 5 Pro scores a meager 1,13,131 on AnTuTu. As far as benchmarks are concerned, the Honor Play is definitely a great phone in its price range, only faltering when it’s put up against behemoths like the OnePlus 6 that pack in Qualcomm’s flagship Snapdragon 845. However, that doesn’t mean the same will be observable in real-world performance as well, so we tested out gaming on the Honor Play, the OnePlus 6, and the Redmi Note 5 Pro. Since not all games make use of the GPU Turbo technology that Honor has packed inside the Honor Play, we stuck with games that do support it — PUBG Mobile, and Mobile Legends. If I had the highest expectations of seeing a drastic improvement in performance with GPU Turbo, it was on PUBG Mobile — a game that’s demanding, has intense gunfights, and is a really famous game on Android. I used GameBench to check out the FPS of the game during gameplay, as well as to get insights on the performance of the game over time. The following are my observations. The Honor Play maintains a consistent frame-rate of around 25-30FPS in game, which is okay I guess. However, after profiling the game, GameBench showed that the average FPS for the game was 40FPS, and the frame-rate stability was at 76%. Plus, the variability of the frame rates was at +/- 1.19FPS. Running PUBG Mobile on the OnePlus 6, I once again observed a similar 30FPS frame rate in-game, and GameBench showed the average frame rates to be 40FPS, along with an impressive stability of 96%. That’s a lot more than what the Honor Play had. Along with that, the variability of the frame rates was at +/- 1.05. On the Redmi Note 5 Pro, GameBench shows a median FPS value of 26FPS, and a stability of 94% which is considerably higher than the Honor Play and quite close to the OnePlus 6. The variability of the frame rates is lower here too, at +/- 1.16FPS. Next up, I tried Mobile Legends — a game I’ve never played before, but supports Honor’s GPU Turbo technology. The Honor Play got an average FPS of 30FPS which sounds fine, along with a frame rate stability of 79%. Along with that, the variability of the frame rates was found to be at +/- 3.1 FPS. The OnePlus 6 fares better than the Honor Play, getting an average frame rate of 30FPS with a higher stability value at 84%. The variability of the frame rate here was +/- 3.44FPS which is higher than the Honor Play. Finally, I played the game on the Redmi Note 5 Pro which scored an average frame rate of 29FPS which is not really noticeably lower than the scores on the OnePlus 6 and the Honor Play. However, the stability here was at 72% which is lower than the Honor Play. Also, the variability of the frame rates was recorded as +/- 4.01 FPS which is definitely considerably higher. Honor also claimed that GPU Turbo will reduce battery consumption while gaming by 30%, and we put that to the test as well. We handed over the Honor Play, the Galaxy S9+, the Nova 3, and the OnePlus 6 to the best PUBG players in our office and had them play the game for 1 hour continuously. Starting off with all phones charged to 100%, after 30 minutes of gaming, the Honor Play was at 83%, the Nova 3 was at 86% (which is noteworthy because it has the same battery size, but no GPU Turbo), the OnePlus 6 was at 79%, and the S9+ was at 89%. The S9+ has a lower battery capacity than the Honor Play but still managed to be more efficient. After a full 1 hour of PUBG, the Honor Play was at 69%, the Honor Nova 3 was at 73%, the OnePlus 6 was at 64%, and the S9+ was at 78%. So yeah, it’s quite evident that GPU Turbo doesn’t really help with the battery life at all; in fact, it might actually be hurting it to some extent. 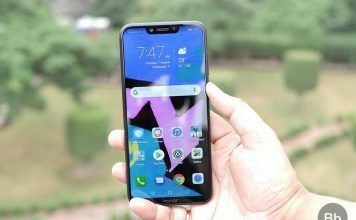 So the Honor Play is definitely the best smartphone you can get in its price range as far as performance is concerned. After all the phone comes with Huawei’s flagship Kirin 970 processor, features a Mali G72 GPU and has GPU Turbo on top of it all to further enhance gaming experience. However, in my usage, I don’t really think GPU Turbo makes a noticeable difference in the gaming performance of the phone. True, it’s better than the Redmi Note 5 Pro, but that’s expected since the Honor Play is packing basically the Kirin equivalent of the Snapdragon 845; and when compared to that, the Honor Play still lags behind the Snapdragon 845 touting OnePlus 6. That said, the Honor Play will be getting further improvements including 4D Gaming Experience that’ll bring features like smart shock to the phone along with a 3D surround sound feature for wired earphones. Those features, along with the price at which the Honor Play is being sold for, make this phone the unchallenged performance champion in its price range. What do you think of the Honor Play? Are you hyped about GPU Turbo, or do you (like me) feel like it’s more of gimmick than something that actually helps? Let me know in the comments section below.